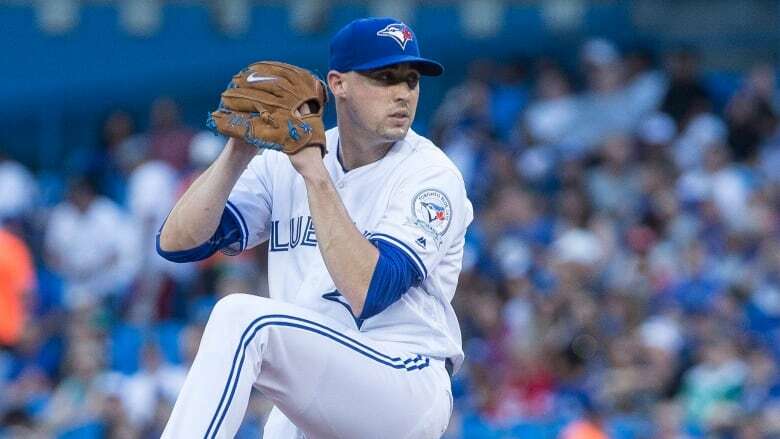 Aaron Sanchez will remain in the starting rotation for now, as Toronto Blue Jays general manager Ross Atkins said Thursday the team will adopt a six-man rotation for the foreseeable future. Aaron Sanchez isn't going anywhere. The Toronto Blue Jays right-hander will remain in the team's starting rotation — which will be expanded to six pitchers — for the foreseeable future, according to general manager Ross Atkins. "What I think is the most likely scenario is that he stays in the rotation for some time to come," Atkins told reporters in Houston prior to Toronto's series finale with the Astros. Atkins and the rest of the Blue Jays front office have maintained all season that the 24-year-old Sanchez would move to the bullpen at some point this year to help preserve his arm. Sanchez, who was moved to the bullpen following the MLB all-star break last year, has been dominant for Toronto this season, going 11-1 with a 2.71 earned-run average in 21 starts. He's also struck out 118 and maintained a 1.13 WHIP (walks and hits per inning pitched). His strong first half of the season earned him his first all-star nomination. "I think what changed for us, a couple of things: input from more people, one of those people being Francisco Liriano, who was open to anything and everything," Atkins said. "That opened things up for us to think about things differently. And then talking to Aaron about it and how strongly he felt about staying in the rotation, that fortunately we're in a situation where we're able to do it." The Blue Jays acquired Liriano from the Pittsburgh Pirates during Monday's non-waiver trade deadline for pitcher Drew Hutchison. Toronto also received prospects Reese McGuire and Harold Ramirez. The left-handed Liriano, who is 6-11 with a 5.46 ERA this year, is scheduled to start Friday night against the Kansas City Royals. Atkins added that it's not a definite that Sanchez would move to the bullpen later this season. "I think what we're going to do is really try to work with Aaron to give this team the best chance to win," Atkins said. "We do have thresholds that would be uncomfortable. There's not a scenario where he pitches 220, 230 innings. "He's going to go into a territory that's uncomfortable and uncommon and he's comfortable with that. We've worked together on what that range or territory should be but there's so many variables that will contribute to what's best for him and this team."